In many ways, the scroll saw is the ultimate piece of equipment for fancy woodworking. It can make straight or very complex curved cuts in a variety of materials including hard or soft woods, plastics, non-ferrous metals, ivory and mother-of-pearl. It's also one of the only machines which can make piercing cuts--like a donut hole-in the center of a workpiece. 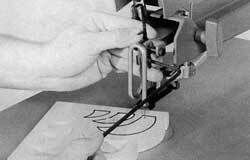 These capabilities make the scroll saw ideal for cutting intricate scrollwork or making tiny models and miniatures. It's perfect for inlay, marquetry (inlaid veneer) and intarsia (wood mosaic). And with the proper blade installed, it even cuts finely enough for ornamentation or jewelry making. Many woodworkers are confused about the difference between a jigsaw and a scroll saw because the terms are often used almost interchangeably. In fact, the scroll saw can do just about anything a jigsaw can do, but it does it better! That's because of differences in the way the two machines operate. A conventional jigsaw powers the blade down through the cut and uses a spring to pull it back up. Since the spring is seldom fast enough to keep pace with the lower power cylinder, the blade tends to bend in the middle which produces a rough cut and leads to premature blade breakage. With the scroll saw, however, the blade is suspended between two parallel arms. These arms move up and down with the blade, so the blade is under constant tension during both the up and down stroke. This reduces blade bending and breakage-and the slight forward and backward motion of the blade allows the teeth to cut smoothly, so sanding is often completely unnecessary. Figure 15-1. 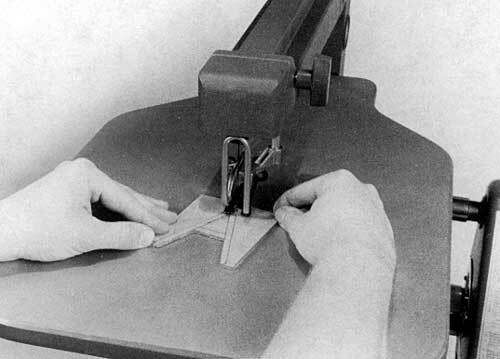 One model of the scroll saw mounts on the MARK V.
The scroll saw is available in two models. One can be installed at the power mount end of the Mark V (Figure 15-1) and the other is a freestanding unit with a separate motor and stand (Figure 15-2). 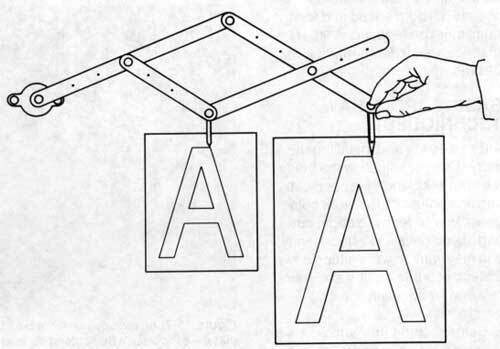 To set up your scroll saw, follow the instructions in the Owners Manual that came with your scroll saw. Figure 15-2. A freestanding model is also available. With the proper blade installed, the scroll saw will cut stock up to 2" thick. It has a throat depth of 20" which means you can cut to the center of a 40" wide workpiece. The blade mounting blocks will accept blades ranging from 1/4" wide (very heavy) to 6/0 (very fine). The stroke of the blade is 1-3/32". 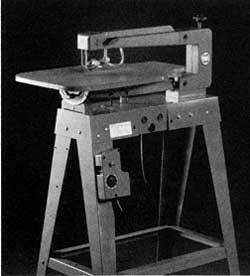 The scroll saw accepts virtually all standard 5" jigsaw or scroll saw blades with plain, straight ends. Blade selection will be based on the thickness and type of material being cut; the amount of fine detail in the project; the cutting speed; and the desired quality of the finished cut. For best results, use the thickest blade available that will make the necessary turns without binding or twisting. There should be at least two and preferably three teeth across the thickness of the workpiece. Cutting veneer or other very thin material may require blades with 60 to 80 teeth per inch. As the thickness of the stock increases, use a heavier blade with fewer teeth per inch. Only the coarsest blades have "set" in the teeth. Thin blades tend to bow in thick stock and fine-toothed blades may not be able to easily remove sawdust from the cut. Use a blade with hardened teeth for cutting aluminum, brass, silver and other non-ferrous metals. Wood cutting blades will dull very quickly in metal. Use the blade backup only when sawing stock over 3/4" thick. Otherwise adjust the backup away from the blade. Two special types of blades are also available. First is a reverse tooth blade with the three lower teeth pointing up instead of down. These reversed teeth help eliminate splintering along the bottom side of the cut when working with thick stock. The second type is a spiral blade which will cut in any direction without turning the workpiece. Although spiral blades may be useful in certain situations, there are tradeoffs. Spiral blades tend to follow the grain of the wood instead of the intended cutting line-making it difficult to cut smooth, graceful curves-and the cut is much rougher, so more sanding is required. Never reach beneath the table while the scroll saw is running. When removing the blade, release the blade tension before loosening the chuck locking pins. Never attempt to cut a radius that's too tight for the blade. Never turn on the scroll saw with stock pressed against the blade. Never cut extremely small stock. Cut small components from larger stock. Adjust and lock the holddown, check blade tension and adjust the blade backup as required for each operation. Install the blade with the teeth pointing toward the table. Before you turn on the machine, turn the drive shaft by hand to be sure the blade moves freely. Do not force stock against the blade or try to cut too quickly. Keep the table tilt locked. Do not use worn or damaged blades, or a worn blade backup. When mounting the scroll saw on the Mark V, secure the accessory mount lock, power plant lock, and the scroll saw mounting tubes. Figure 15-3 . The grid system is commonly used to enlarge an illustration to create full size patterns. Click on image to see larger view. 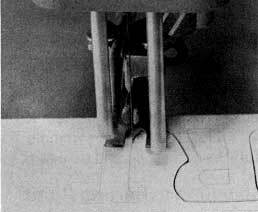 Full size patterns for scroll saw projects are available in magazines and books as well as from commercial suppliers who provide letter templates for signs or complete project plans. 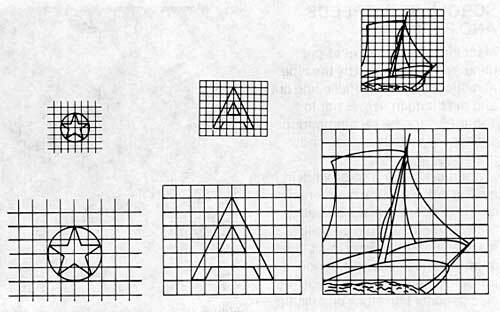 If your plans are not full size, they can be enlarged by methods such as the grid system (Figure 15-3) or by using a pantograph (Figure 15-4). Figure 15-4 . A pantograph makes enlarging or reducing plans quick and easy. Click on image to see larger view. Another very effective way to produce full size patterns is by using a copier machine which can enlarge and reduce. By making an enlargement of an enlargement, small drawings can be quickly and accurately increased to many times their original size and the cost is minimal, even if several copies are required. Figure 15-5 . With dark woods or for more accurate results, patterns can be mounted directly to the stock. The full size pattern can then be transferred to the stock in several ways. For light colored wood you can use carbon paper or trace around a heavy paper cutout of the piece. 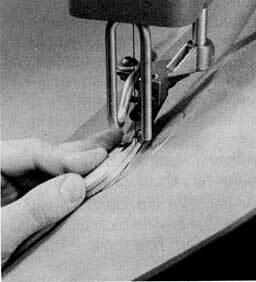 On darker woods or for very accurate work it is usually easier to attach the pattern directly to the stock before cutting (Figure 15-5). This can be done with a thin coating of rubber cement or with a spray adhesive. After the stock has been cut, you can easily remove the pattern by belt sanding. If the pattern is reversible, you can even leave it attached to the back side of the project. In either case, the pattern will be destroyed, so you will want to make copies for duplicates or in case of cutting mistakes. Machine speed (in strokes per minute) is determined by the type and thickness of material being cut and the blade in use. Refer to Table 15-1 for the recommended speeds for various blades and materials. For most general scroll work in hard or soft wood the higher recommended speeds will be best. Slower speeds should be used when working with very thin blades or hard, brittle materials or non-ferrous metals. 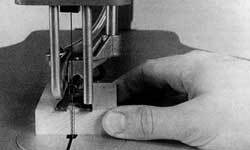 Slower speeds are also good for thin stock or delicate materials such as veneer. Some woods, such as walnut, tend to burn at higher cutting speeds, so both speed and feed rates must be reduced. A little practice and experimentation will be time well spent. Figure 15-6. A scoring cut in a thick piece of scrap is a way to check that the blade and table are square. After selecting and installing the correct blade, adjusting the blade tension, checking the speed setting and adjusting the work hold-down, you're ready to begin cutting. If you have a tall stool handy, you may want to work sitting down instead of standing. It's a lot more relaxing--especially for long sessions. Before cutting thick stock, it's a good idea to be sure the table is square to the blade. This can be checked with a square or a thick piece of scrap wood. Just feed the scrap stock into the blade enough to score the wood slightly--then swing the piece around behind the blade (Figure 15-6). If the table and blade are square, the blade will be aligned perfectly with the kerf. If not, adjust the table to eliminate half the difference and try again. Figure 15-7. An outside corner makes the best starting point. Avoid starting at a curve -- especially whn cutting parallel to the grain. Selecting a Starting Point The best place to begin cutting is almost always at an outside corner (Figure 15-7). Then when you come around the workpiece you can finish off with a sharp, clean corner with little or no sanding. 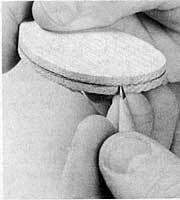 If you must begin cutting along a curve--such as when sawing a round circle--begin cutting across the grain, not parallel to it. This reduces the tendency for the blade to follow the grain and make a bump or dip where the cut begins and ends. You may even want to begin and end the cut slightly outside the pattern line and then sand away the excess to produce a perfectly smooth curve. For general cutting, press the stock lightly against the table and feed it smoothly into the blade. 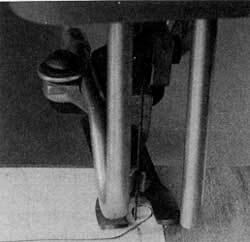 When properly adjusted, the hold-down will minimize vibration and yet be loose enough to allow the stock to move freely. The scroll saw cuts fairly quickly, but don't try to force the stock or you'll bend the blade and reduce the accuracy of your cut. In most cases, slower feed rates will result in a smoother finished cut. This is especially true when cutting very soft or stringy woods and less critical on harder woods such as maple or oak. 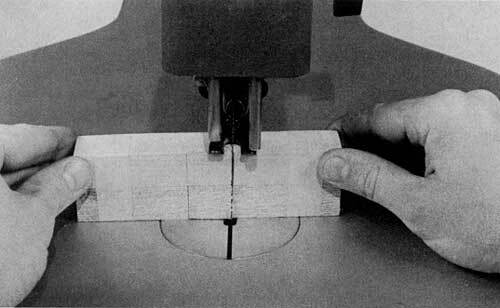 If you're new to the scroll saw, you may be tempted to cut slightly outside your pattern line and then sand away the excess. Although this can be done, the scroll saw cuts so smoothly that sanding is seldom required. Therefore, practice cutting right on the pattern line and eliminate the extra work, except for special situations as mentioned above. On straight cuts--especially with heavier blades--you may find that the blade tends to "lead" or cut slightly to one side of your intended line. This is caused by the set of the blade or minor imperfections in the teeth which cannot be eliminated during manufacturing. It's easy to compensate for this problem by feeding the stock at a slight angle--usually two to four degrees. You may also notice a tendency for the blade to follow the grain of the wood when you are ripping or cutting parallel to the grain. This problem can be eliminated by slowing your feed rate to give the blade plenty of time to cut. 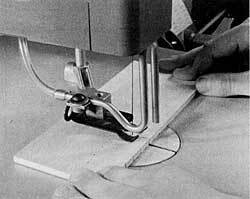 Although a constant tension scroll saw will permit you to make turns in an area only slightly larger than the width of the blade, no machine can cut a sharp, square inside or outside corner in a single pass. Therefore, some compromise or combination of techniques must be used. Figure 15-8. Sharp outside corners can be cut: (A) in two passes or (B) by looping around in the scrap area. Outside corners are usually cut in one of two ways. One method is to cut completely across the stock and out, then turn the workpiece and begin cutting in the new direction (Figure 15-8A). The other method is similar, but you simply loop around in a scrap area and come into the corner from the new direction (Figure 15-8B). Sharp, clean inside corners must also be cut in two passes which intersect at the corner. 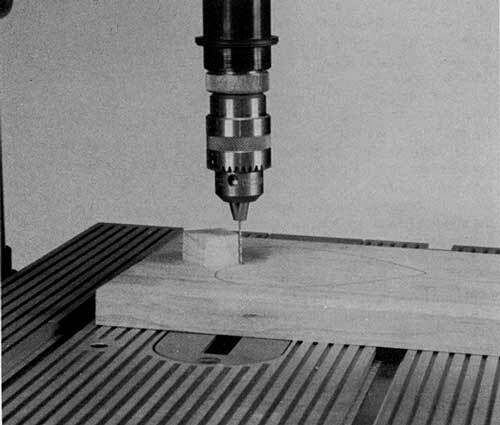 This can be done by cutting into the corner from one direction, then backing the blade out through the kerf and approaching the cut from another angle (Figure 15-9A). An alternative is to cut into the corner from one angle, back up slightly and cut across the corner, then come back to clean out the small remaining piece of scrap (Figure 15-9B). Figure 15-9. Sharp inside corners may be cut: (A) in two passes or (B) by cutting across the corner, then coming back to remove the remaining scrap. 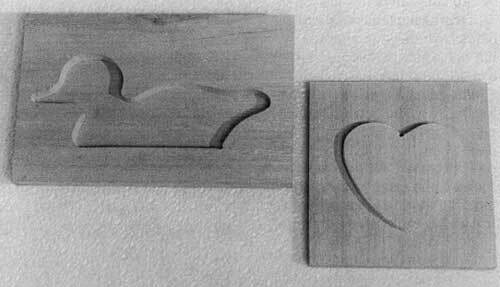 Many scroll saw projects do not require perfectly square corners and a tight radius turn will be all that's required. Unlike a bandsaw or jigsaw, the scroll saw lets you turn almost on-the-spot by spinning the workpiece around the blade. Just hold the stock against the table and spin it smoothly and quickly, being careful not to press sideways and deflect the blade. This spinning technique is easy to learn. 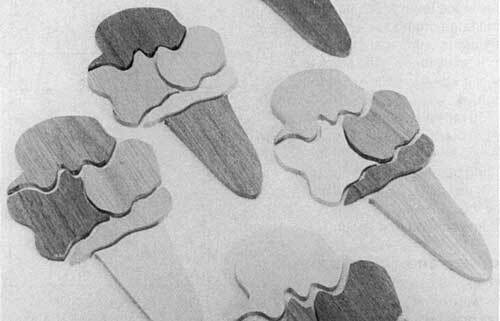 Practice making these on-the-spot turns with a scrap piece of 1/4" thick stock until you can make a cut, turn 180� and come back out the original kert (Figure 15-10). Always take a minute to plan your cuts--especially in delicate or intricately detailed scrollwork. Whenever possible, break complex designs up into several simple curves or shapes and don't hesitate to back up along the kerf or leave the pattern line and cut into the waste area to get a better angle for the next section. Figure 15-10. With a little practice the scroll saw can make 180° turns in little more than the width of the blade. In some cases--such as cutting inlays or matching parts--there will be no waste stock, so the en-tire shape must be cut in a single pass. In these cases, you may want to simplify the design to make cutting easier or you can practice cutting the shape in scrap stock to locate trouble spots and develop confidence. Figure 15-11. Several layers of material can be stacked, fastened together temporarily and cut all at one time for duplicate parts. 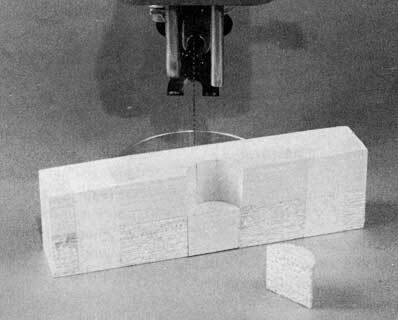 Pad sawing-or cutting several layers of material at once-is a great way to save time when you need duplicate pieces for a project (Figure 15-11). You can also create special effects by stacking different types of woods and then mix-ing colors and textures during final assembly (Figure 15-12). For pad sawing, transfer your pattern to the top piece and then stack as many layers as you need-up to 2" thick. You can hold the layers together temporarily with nails or brads in the scrap area, by taping around the outside of the stack, or with double-faced tape between each layer. Figure 15-12. Mix woods of different colors and textures to create unique effects. It's also a good idea to be sure the table and blade are square before starting the cut. Even a slight angle will result in finished pieces of different sizes. Figure 15-13. Several layers of material can be stacked, fastened together temporarily and cut all at one time for duplicate parts. One of the most useful features of the scroll saw is its ability to make cutouts in the center of a workpiece. 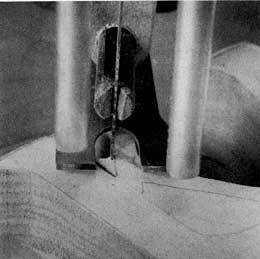 These piercing cuts are made by unclamping one end of the blade, threading it through a starting hole and then reinstalling the blade before making the cut (Figure 15-13). The starting hole should be located close to the layout line--preferably close to an inside corner to reduce wasted effort cutting across the scrap. The starting hole should also be 3/4" in diameter whenever possible. This saves time because the mounting block and blade can pass through the hole. On more delicate work the starting hole can be only slightly larger than the width of the blade, but the blade must be removed from the upper blade mounting block, threaded through the hole and then reinstalled. When removing and remounting the blade use the blade clamp shim to prevent the mounting block from turning and be careful not to bend the blade. Be sure the blade is properly seated in the mounting block and readjust the blade tension before cutting. Figure 15-14. When Chamfering irregular shapes, (A) draw a gauging line around the workpiece and then (B) saw to the line with the table tilted. The scroll saw table tilts either right or left and locks at any angle from "0" to 45�. This allows you to add decorative bevels or chamfers to workpieces and also makes it possible to cut inlay or relief pieces which will fit into the background with no visible saw kerf. These inlay techniques are described later. In general scrollwork, almost any shape can be cut with a beveled edge; however, the complexity of the shape and angle and direction of the bevel will limit how smoothly and accurately the cut can be made. For example, outside curves, such as a circle, can be cut very easily even with a 45� bevel, but tight inside curves become more and more difficult as the radius gets smaller and the angle of bevel increases. It is also important to keep the workpiece on one side of the blade if the bevel is to point in the same direction--either in or out--all the way around the piece. This can limit the complexity of your designs because tight curves and corners may have to be cut in a single pass instead of backing up and approaching them from the opposite direction. Advance planning and your own skills are especially important when cutting pieces where the bevel will be visible on the finished project. The best way to master bevel cutting is to practice with scrap stock before beginning on a project. Depending on whether you are right or left handed, you'll probably find it more comfortable to tilt the table one way or the other and turn the workpiece either clockwise or counterclockwise. The table tilt and direction of rotation will also determine which way the bevel faces. 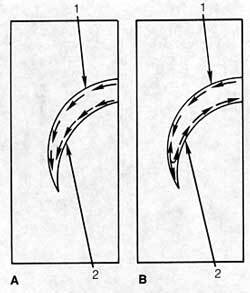 Chamfers are similar to bevels except that only a portion of the edge is cut at an angle, so a second pass must be made after the piece is cut to shape. A common chamfer angle of 45� results in the same amount of stock being cut from the face and the edge of the piece. Other angles will change this relationship. Depending on the angle of cut, the chamfer line can be marked on either the face or the edge of the workpiece to serve as a cutting guide (Figure 15-14). As with beveling, accurate chamfering is difficult-especially on tight inside turns, so after the chamfer is cut, go back over the edges with sandpaper or a file to remove rough spots or other imperfections. Figure 15-15. 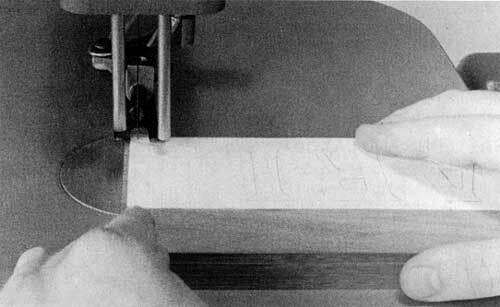 When sawing inlays, experiment with the table tilt until distances "A" and "B" are equal. The inlay will then fit snugly into the background. Click on image for larger view. Flush inlays of complimentary or contrasting woods can be used to accent your most sophisticated projects. They can be made with no visible gap or saw kerf thanks to the scroll saw's piercing and bevel cutting capabilities. But professional looking inlays require patience and practice because a very slight bevel angle is used and both the background and insert pieces are cut at one time. This means there Will be no waste area for repositioning the stock, so your planning, setups and cuts must be made very accurately. 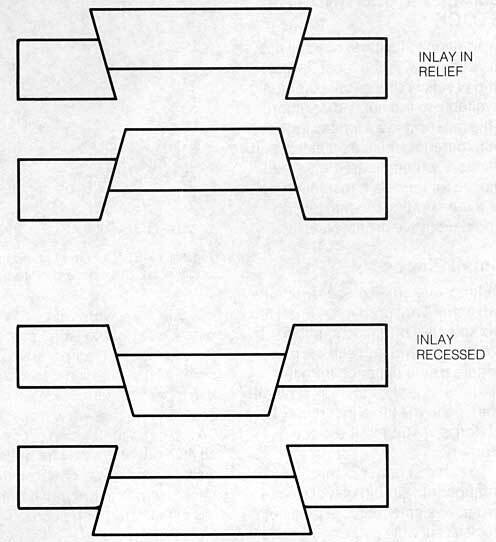 After selecting your pattern and stock, the correct table tilt must be determined. This angle will usually be between one and eight degrees, depending on the thickness of the stock and the width of the saw kerf. It is easiest to find this angle by trial and error (Figure 15-15). 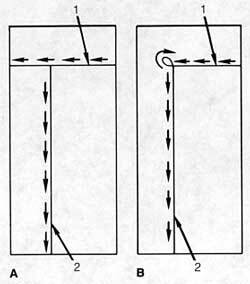 You should also consider which way the table will tilt and which direction the stock will be rotated during the cut. Either direction will work as long as you plan it that way. 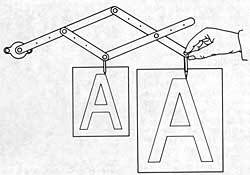 For example, tilting the table to the right and rotating the stock clockwise will make the lower piece fit into the upper one. Tilting to the left or cutting counterclockwise will make the upper piece fit into the lower one. Figure 15-16. Tape scrap pieces of the background and inlay stock together. Make trial cuts until pieces fit correctly. When your setup is ready for a test, tape scrap pieces of the background and inlay stock together and cut out a trial piece at the edge of the stock (Figure 15-16). Be sure to rotate the test piece in the same direction you will be using for your final cuts. 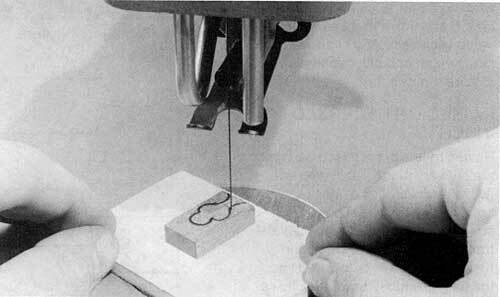 Then try fitting the inlay test piece into the background (Figure 15-17). When the correct angle and direction of rotation is used, the in lay piece will fit snugly into the background with only enough room to allow for glue. If the test piece is too small or too big, adjust the table tilt slightly and try again until the pieces fit correctly. Figure 15-17. Fit the inlay pieces into the background. You may also want to increase the blade tension somewhat for cutting inlays because bulges or bowed cuts can ruin your project. This increased tension will cause blades to break more frequently, but with a little practice, you'll find a good compromise. When everything is ready, fasten the inlay and background pieces together as you would for pad sawing and drill a hole to insert the blade. 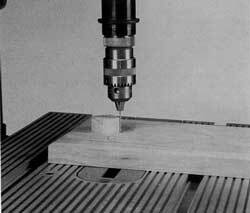 This hole must be drilled at the same angle as the table tilt, so cut a piece of scrap or use your test piece as a drilling guide (Figure 15-18). Since this hole must be filled when the project is complete, make it as small as possible for the blade you're using and drill close to an inside corner or other inconspicuous location. Figure 15-18. Use your test piece as a guide for drilling a hole for the blade at the proper angle. Finally, if you're making duplicates or cutting several designs with the same stock and blade, go ahead and finish them all while the setup is correct. Any change in blade width or stock thickness will require a new setup. Figure 15-19. Reliefs and recessed inlays may be cut to install from either the front or back. Raised reliefs or recessed designs are cut very much like inlays, but two different pieces of stock are not usually required. 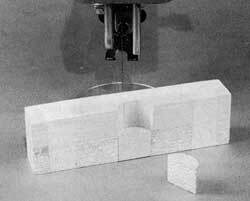 The desired shape can often be cut on a bevel from a single piece of stock and then raised above or lowered into the background to produce a three dimensional effect (Figure 15-19). Contrasting stains or other techniques can then be used to highlight important areas or create special effects. Table tilt and blade angle are less critical than they are for inlays. Any angle will work as long as it is wide enough to cover the saw kerf. The greater the table angle, the less relief or recessing you will achieve. With a little experimentation you can create striking designs with multiple levels above and below the basic background. Also think carefully about the direction of rotation of the workpiece into the blade. 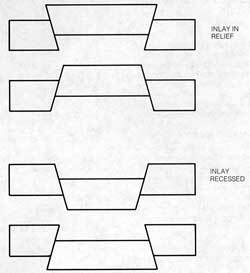 One direction will produce a raised relief-the other a lowered recess. Either can be attractive as long as it's what you had planned. Figure 15-20. Bevel cutting can produce recessed or raised relief projects like this. One or both edges bay be rounded over to accentuate certain designs or produce special effects. Reliefs, recesses and inlays can also be accented by sculpting the edges of the insert, background or both (Figure 15-20). This is often done by rounding over the edges with sandpaper or a file to create a visual distinction or to accentuate the shadow line where the two pieces come together. When you're ready to assemble your relief or recessed pieces, hot melt glue fillets on the back side are an effective way of joining the pieces. These fillets are strong enough to hold most decorative projects and yet they won't run onto the edges or face of the project like most woodworking glues, so you save cleanup time and frustration. In addition to its other capabilities, the scroll saw is the most delicate and precise cutting tool commonly available to the home craftsman. This makes it ideal for sawing very thin materials such as plastics and veneers, cutting extremely small pieces for models and miniatures, or even creating custom jewelry and decorative ornaments. Figure 15-21. Cut small components from larger stock or tape the stock to a scrap of plywood, posterboard or cardboard for safety and better control. Cutting very small pieces presents two immediate problems. First, the workpiece is often too small to control by hand and still keep your fingers a safe distance from the blade. Secondly, the normal blade opening in the table insert may be too large to support the piece properly. To achieve better control, small components should be cut from a larger, easier to manage piece of stock. A suitable piece of scrap is often available and the waste is insignificant. 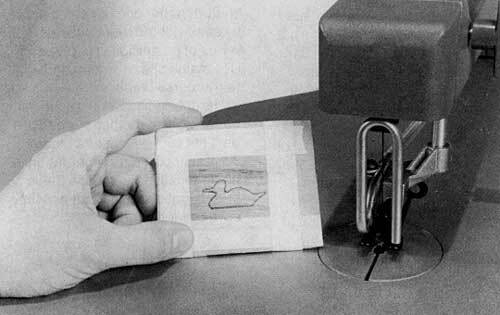 If you must work with a tiny piece, use doublesided carpet tape to mount it temporarily on a scrap of plywood, posterboard or cardboard (Figure 15-21). In this case, the hold-down will probably be too large to function properly, so lift it out of the way for better visibility and press down on the backup stock to prevent it from lift-ing or fluttering with each up-stroke of the blade. Additional support for cutting very tiny pieces can be achieved by making either a special table insert or complete table covering from hardboard. This covering may be attached to the scroll saw table with double faced tape. Figure 15-22. Make an auxiliary table insert out of harboard to provide extra support for cutting small pieces or thin stock. A hole drilled in the center of the insert accommodates the blade. 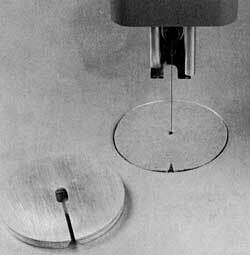 To make a table covering, layout and drill a small hole for the blade in the center of the insert (Figure 15-22). Refer to the Scroll Saw Owners Manual if the blade is not centered in the insert. Check the blade tension and speed setting before beginning your cut. A blade with too little tension will be difficult to control, especially for fine detail. Many people also find that slower speeds are less distracting for close work. Figure 15-23. Tape veneer to cardboard or posterboard for added support and a cleaner cut. Veneers and other thin materials must be handled carefully to prevent splintering and tearing. Choose a very fine blade and adjust the tension to the highest recommended setting. Reduce the tension slightly if blades begin to break frequently. Also select the lowest speed setting--especially if the material is brittle or the piece requires intricate detail. Even if you are using the special insert or table covering mentioned above, you'll get better results by supporting veneers during the cut. 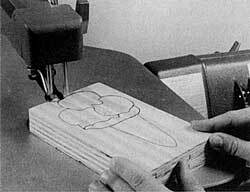 This is easily done by taping the veneer to a piece of cardboard or posterboard (Figure 15-23). Many people sandwich the veneer between two layers of posterboard to prevent fluttering. If they are available and suitable for your project, the new adhesive-backed veneers seem to splinter somewhat less than ordinary types, but even these cut smoother when an additional backup is used. 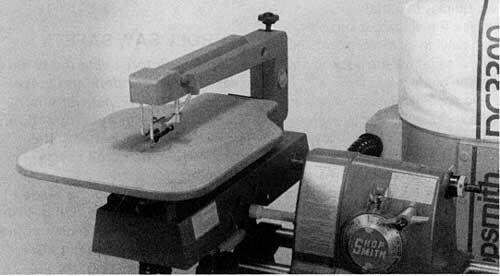 In addition to its woodworking capabilities, the scroll saw can be used to cut a wide variety of materials including nonferrous metals, rigid plastics and even such unusual items as bone, ivory, mother-of-pearl, rubber, cork and paper. Obviously the characteristics of these materials vary greatly, so it is impossible to provide complete instructions in a limited space. The following suggestions should be used as a guide to help you get started, but you'll need to experiment to find the best techniques for each material. Metals vary widely in hardness and ease of cutting, but all metals require blades which have hardened teeth. These blades are identified as suitable for metal cutting and are available from heavy duty sizes down to extra fine jeweler's blades. Caution: Trying to cut metal with an ordinary woodworking blade will dull the teeth and ruin the blade almost immediately. Some metals may be cut dry while others require lubrication. When using lubricating fluids, disconnect the air blower tube to keep from blowing the fluid away from the cutting line. Ideal cutting speeds also vary from metal to metal, but when in doubt it's usually best to start slow before trying faster speeds. Many of the softer metals--such as silver, gold, copper and brass--seem to be almost selflubricating and cut well dry. Aluminum, although a soft metal, cuts better when a light oil or a tap and die lubricant is used. Although some very hard metals such as steel can also be cut with the scroll saw if necessary, it is difficult to do and not generally recommended. Warning: If you must try it, use slow speeds and feed rates, keep the blade lubricated to reduce dulling, and never attempt to cut steel more than 1/4" thick. Thin sheets of metal often form a burr on the bottom side. This can be minimized by backing up the metal with a piece of plywood or similar material. Any remaining burrs can be removed with emery cloth or a file. Caution: Cutting metal will leave abrasive dust on the scroll saw and the Mark V. Always clean up carefully after each work session to protect your equipment. Figure 15-24. When cutting plastics, leave the protective paper in place or tape both sides of the cutline to reduce heat and scratching. Plastics vary even more widely than metal in density and ease of cutting. In general, use the coarsest blade available which has at least three teeth in contact with the work and does not produce chipping on the bottom side. The harder and denser varieties of plastics often cut like wood, so fairly high speeds and somewhat finer blades may be used. Medium-hard plastics such as acrylics are often difficult to cut because they create more friction and heat. As the heat builds up, the plastic starts to melt and weld itself back together. These materials should be cut with the protective paper covering still intact or with a piece of masking tape applied to the cut line to promote cooling (Figure 15-24). Select a blade with some set in the teeth to promote chip removal and slow down or stop completely at the first sign of melting. For very soft plastics such as polystyrene or polyethylenes, reduce the speed and select a very coarse blade with maximum set in the teeth. Use the dust blower when cutting plastics to help cool the blade and rub the cutline with paraffin or a crayon for lubrication. Very soft materials such as leather, paper or cloth can be cut by sandwich ing them between layers of posterboard or plywood. Use a high speed setting and a fairly coarse blade. Hard, brittle materials such as bone, ivory or mother-of-pearl are best cut with a jeweler's blade. Remember, experimentation is often necessary because these brief suggestions cannot possibly cover every situation.